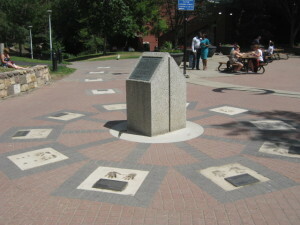 Location: Beaver Hills House Park at 105 St. and Jasper Ave.
Neka’new’ak: “The ones who led the way”. 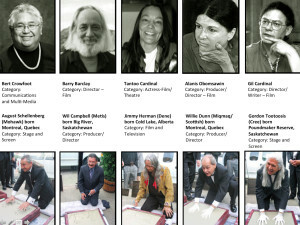 This expanding Walk of Honour has been created the Dreamspeakers Festival Society as a tribute to those Aboriginal artists who have blazed trails in the film industry. It is intended to be a lasting legacy to recognize their efforts and hard work at bringing a new understanding to the varied cultures, traditions, languages and artistic expressions of Aboriginal People in Canada. When the first Dene filmmaker returned home to Canada’s Northwest Territories, his people had no words for his new art. They called it “Dreamtalking”. Edmonton, Alberta becomes the site of an international gathering of our own Dreamtalkers – filmmakers, performers and artists. Indigenous people from around the globe gather to share their common bond, a linkage with a natural world whose harmonies and rhythms are being forgotten by those who came later. Dreamspeakers Film Festival provides a venue for Dreamtalkers and offers a unique exploration into Aboriginal cultures from all parts of the globe. Beaver Hills House Park was named from the Cree translation of the name “Amiskwaskahegan” also used to refer to Fort Edmonton Park.